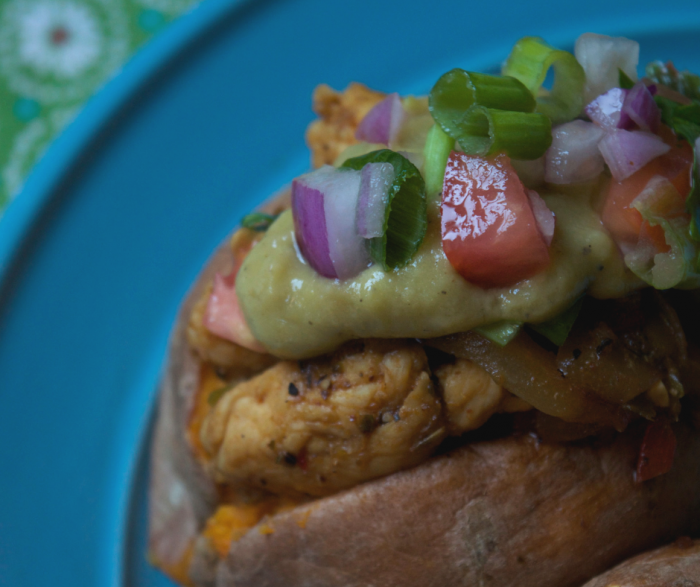 If you want a plate of comfort food, then this Chicken Fajitas Loaded Sweet Potato Recipe is going to become a new favorite. This is so simple and easy to make. I love the idea of having sweet potato as a base for recipes, as it is a favorite root vegetable in our house. Of course, it is pointed, but still, a wonderful healthier option for dinner! 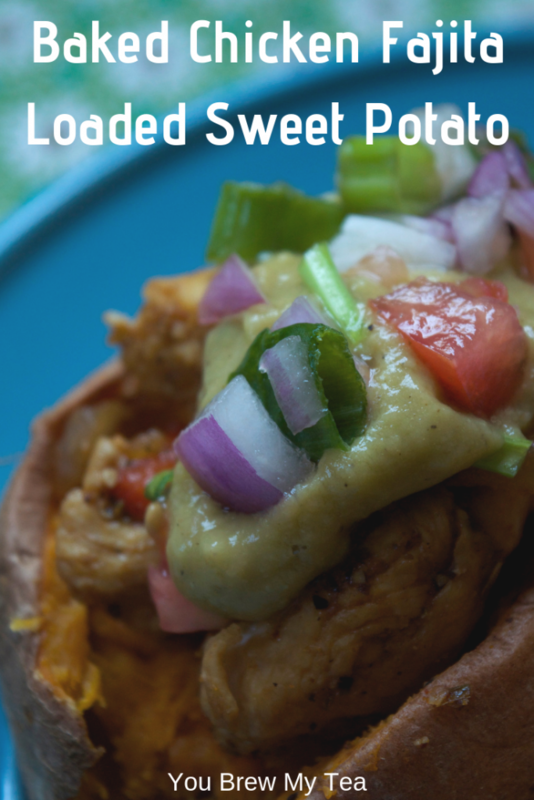 Let me start with the fact that this loaded sweet potato recipe is really just a combination of two of our other favorite recipes. So, you’ll be clicking to them for the full recipes, but I know you will love it. Also, if you are on the WW FreeStyle plan, you know that sweet potatoes are one starch that we have to count on the plan. The best way to accurately do this is to weigh your potatoes. I have a simple Etekcity Electric Digital Kitchen Scale. There are tons of other options out there, but this one was cheap and is easy to use. If you invest in nothing else during your WW journey, a food scale is a MUST. 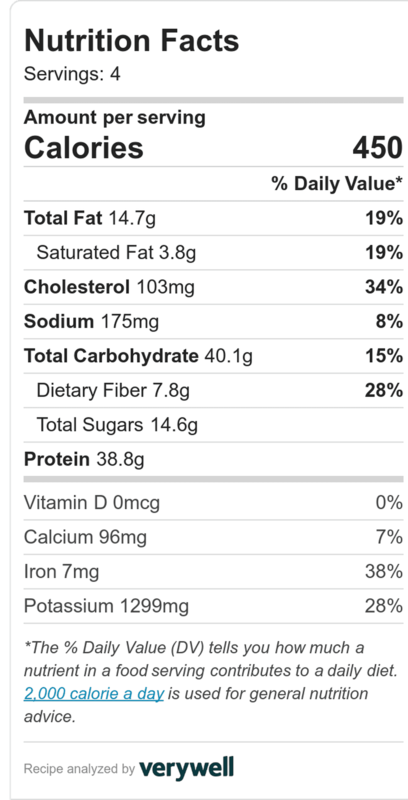 For this recipe, I used medium sweet potatoes. They measured from 4-6 ounces per potato once cooked. So, an average of 5 SmartPoints for a medium sweet potato is typical, in my experience. 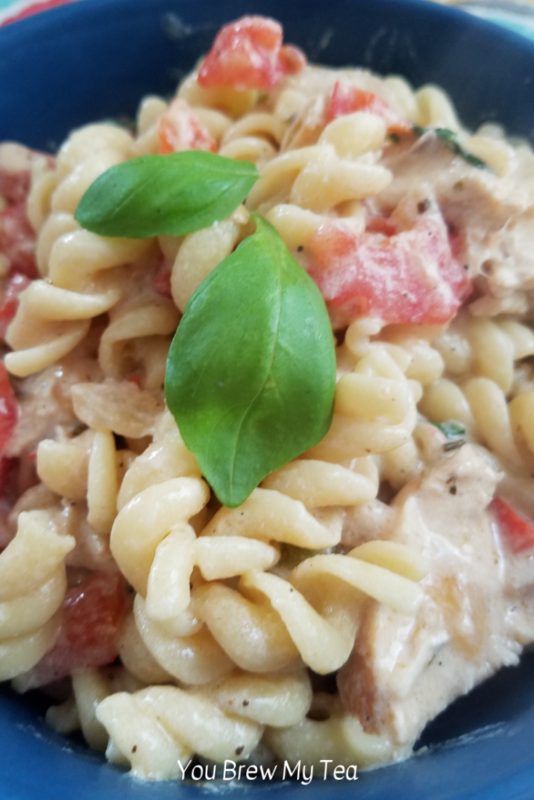 Because I have already shared the recipes before for part of this meal, I am simply linking them below. You will need to follow them to complete the meal. This is really an idea more than a complete recipe for you. Pierce with a fork 2-3 times. Once cooled, slice open or in half, and stuff with 1 serving of zero point baked chicken fajitas, and top with serving avocado sauce. Nutritional information listed below is for the complete loaded sweet potato recipe. I know I repeat this all the time, but it is vital. No matter what recipes you are making, you need good support. Make sure to check out the Facebook groups below if you aren’t already a part of them. These are so good for your journey, especially if you aren’t a part of a local meeting. 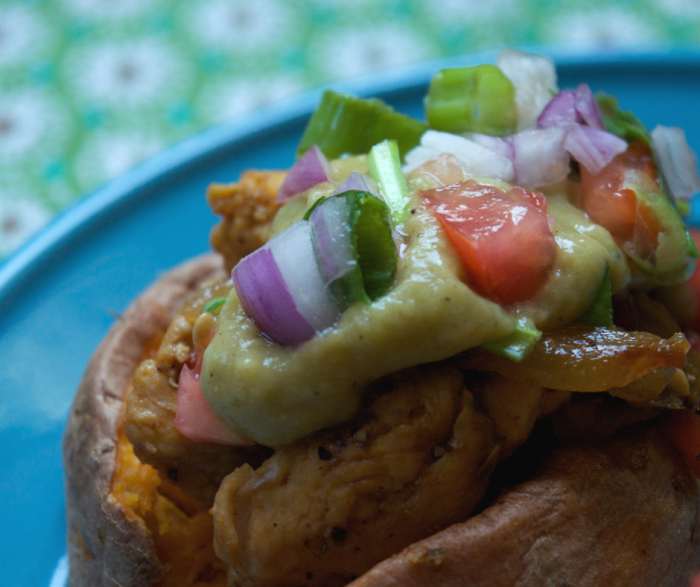 I know you will enjoy this chicken fajita loaded sweet potato idea. 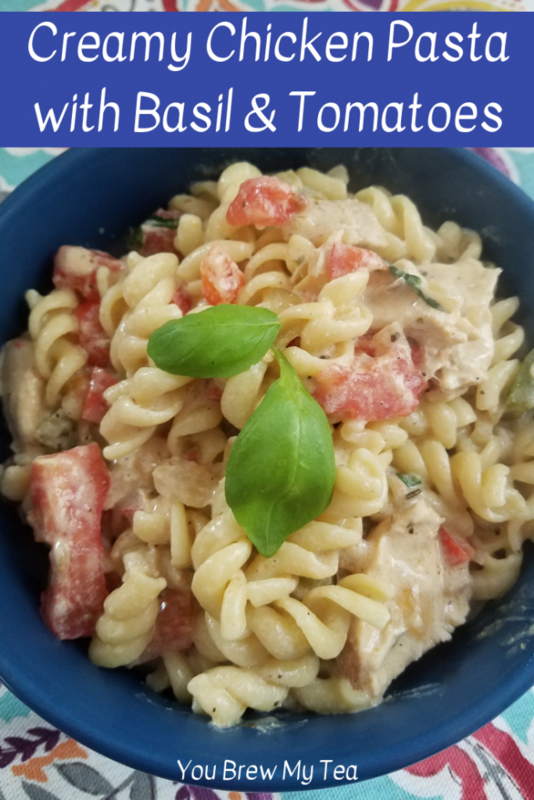 If you are looking for more tried and true WW FreeStyle Recipe ideas, then make sure to check out everything tagged in our Weight Watchers category. Mixing and matching what works for you is how you become truly successful on the WW FreeStyle program. That means not just eating zero point foods, but building a menu around them, and always making sure you don’t feel deprived. Below are some of our most popular or personal favorites to get you started! 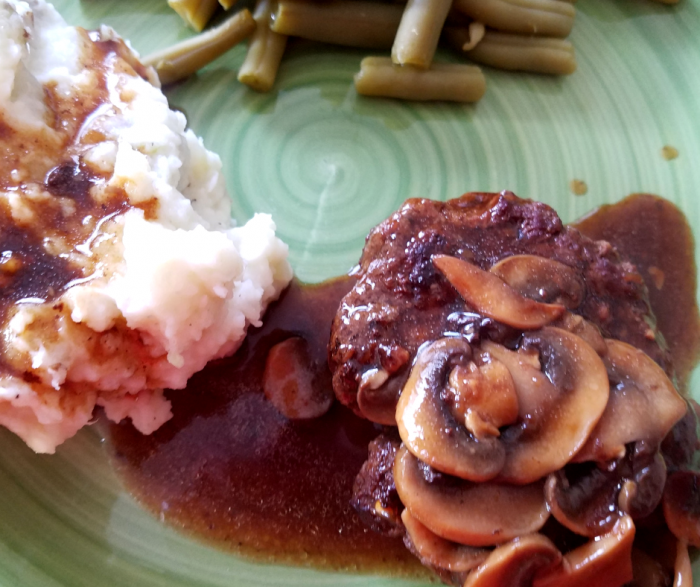 I have never been a big fan of Salisbury steak, but this recipe totally changed how I feel. 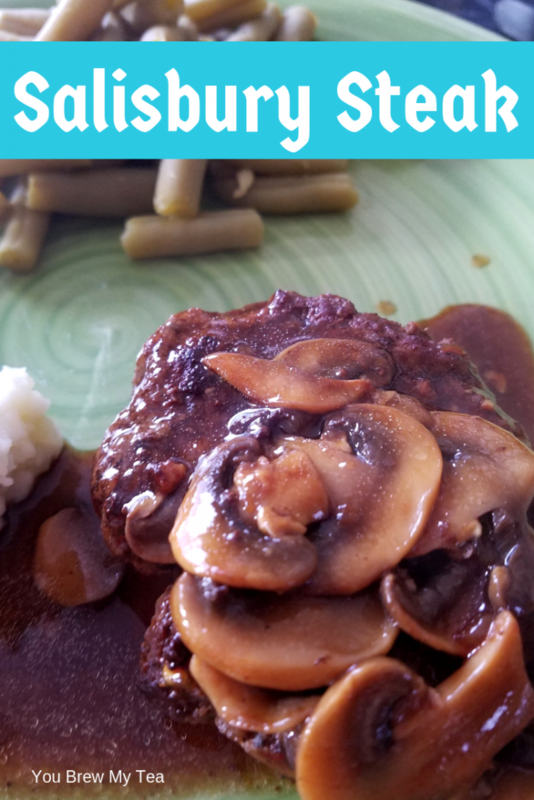 Our WW Salisbury Steak Recipe is a new favorite in our house. It is so easy, lean, and delicious. Plus, my Beau loves that I add mushrooms to the mix for him! You’ll enjoy this as a lower point meal option served with your favorite sides. This post may contain affiliate links. I earn a small commision on purchases made via these links. One of the biggest complaints I hear in our WW Facebook Group every day is that eating beef is too high in points. This just isn’t true! You can easily add beef to your daily regimen and diet when you make the right choices. 1/4 of this recipe is only 5 SmartPoints. That is using an extra lean ground beef. To make ground beef that is super lean not so dry, you need to add a sauce that is also low in points. In this instance, we create a mushroom gravy that isn’t super thick but is full of flavor and easy to make. It keeps the super lean ground beef from being too dry to eat and adds tons of great flavor. Note: When cooking lean ground meats, you will find they can stick to your pan easily. I prefer using a good non-stick skillet like the Cuisinart Chef’s Classic and a spritz of non-stick cooking spray. 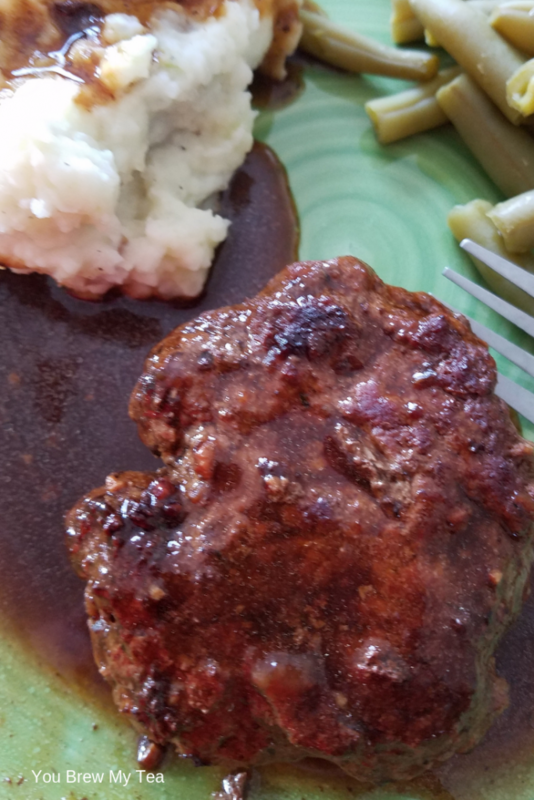 Another tip is to not turn meat too early. When you try to flip it too early, it will stick more. In a medium mixing bowl, combine ground beef, minced garlic, Worcestershire sauce, black pepper, salt, and onion powder. Mix well until seasonings are evenly distributed. In a large non-stick pan that has been sprayed with non-stick cooking spray, cook patties on medium-high heat for 4 minutes per side. Remove patties from the skillet and set aside for later. Reduce heat to medium, and add in butter and mushrooms. Cook mushrooms, stirring occasionally, over medium heat for 5 minutes. They should cook down and begin to brown. In a small bowl, mix 1/4 cup beef broth with the cornstarch and set aside. Scraping any bits of mushroom or meat off the bottom of the skillet, pour in the remaining beef broth. Reduce heat to low. Stir regularly and allow mushroom and broth mixture to simmer for 2-3 minutes. Add in the cornstarch and beef broth and stir well. 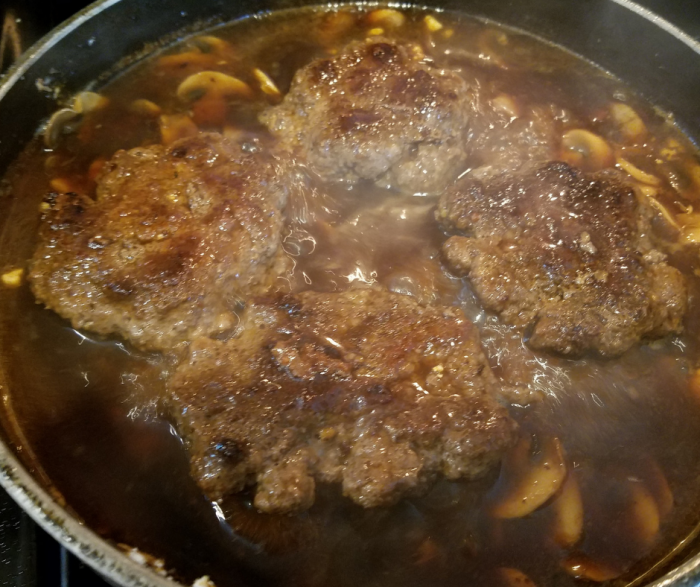 Place beef patties back into the skillet alongside the mushrooms. Simmer on low to medium heat for additional 4-5 minutes. Serve with or without mushrooms and sauce as desired. In a small bowl, mix ¼ cup beef broth with the cornstarch and set aside. 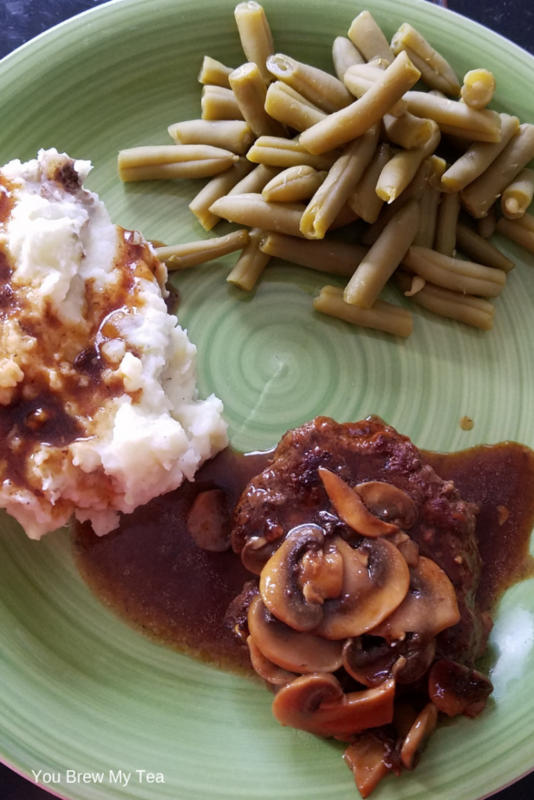 The classic addition to a plate of Salisbury steak for dinner is mashed potatoes. These Weight Watchers Mashed Potatoes are a favorite at only 5 SmartPoints per serving. Add in a heaping portion of a zero point vegetable and you have an ideal comfort food meal that is only 10 SmartPoints! Everyone tries to keep their mealtime points as low as possible. I believe you have to remember to add in flavor and comfort foods. Not every meal needs to be zero points. 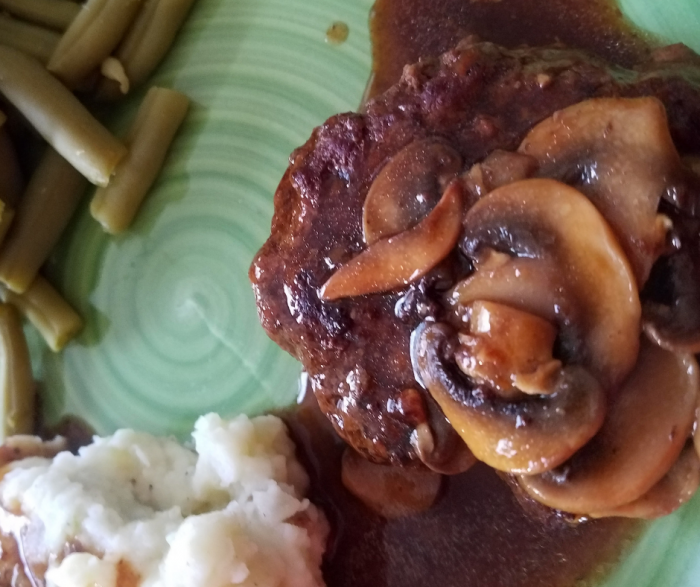 As you can see, this Salisbury steak recipe is a great example. Served with mashed potatoes it can be up to 10 SmartPoints but is still a reasonable portion. You’ll love this on your menu plan! 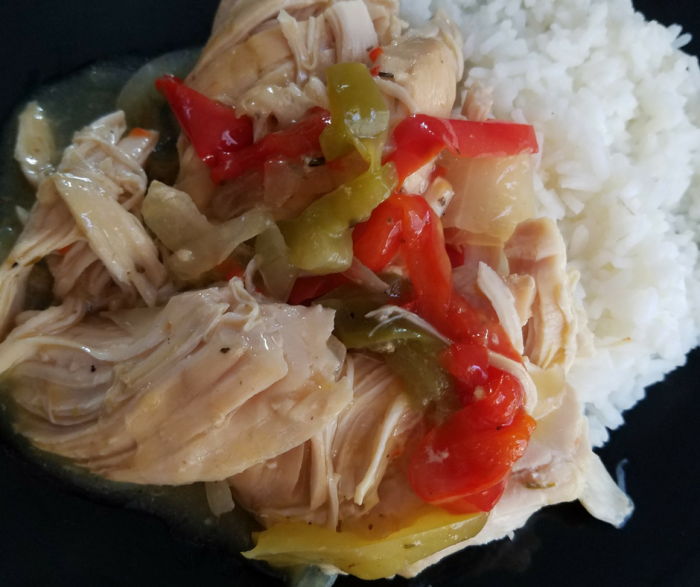 This recipe for Slow Cooker Smothered Chicken Breasts is simply put, the easiest meal ever made. 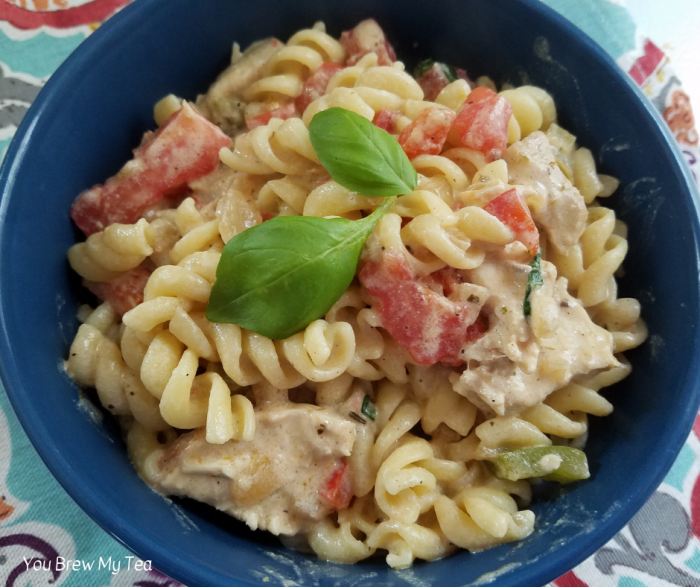 Just a few pantry ingredients and you have a warm satisfying meal that is low in points and perfect for the whole family. 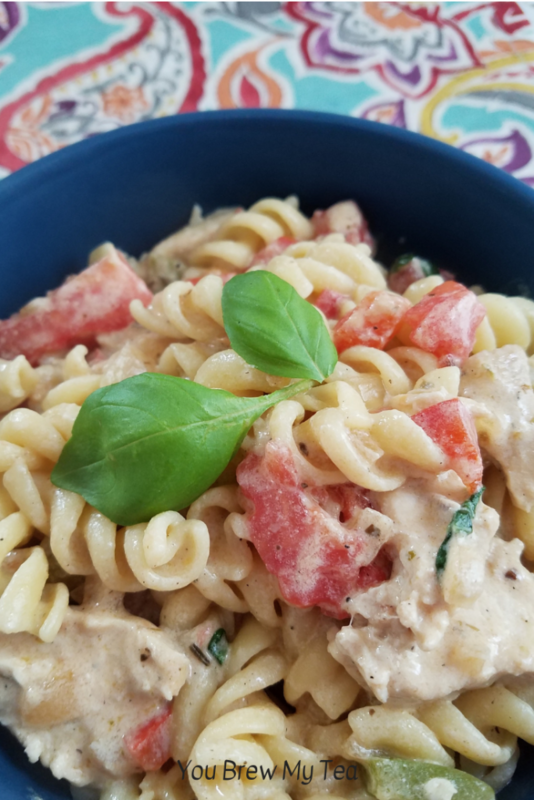 Comfort foods like this recipe are ideal for those busy weeknights when you still want to feed your family something warm and nourishing. 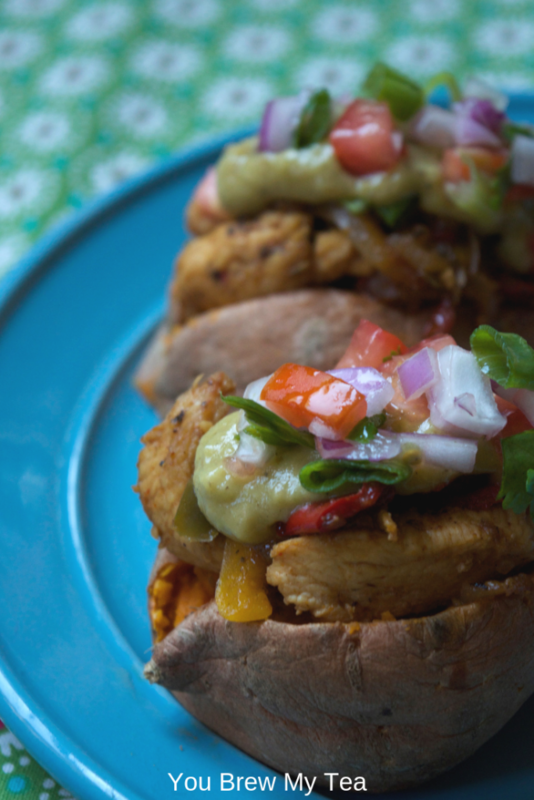 Chicken breasts in the slow cooker have been a classic meal for my entire life. 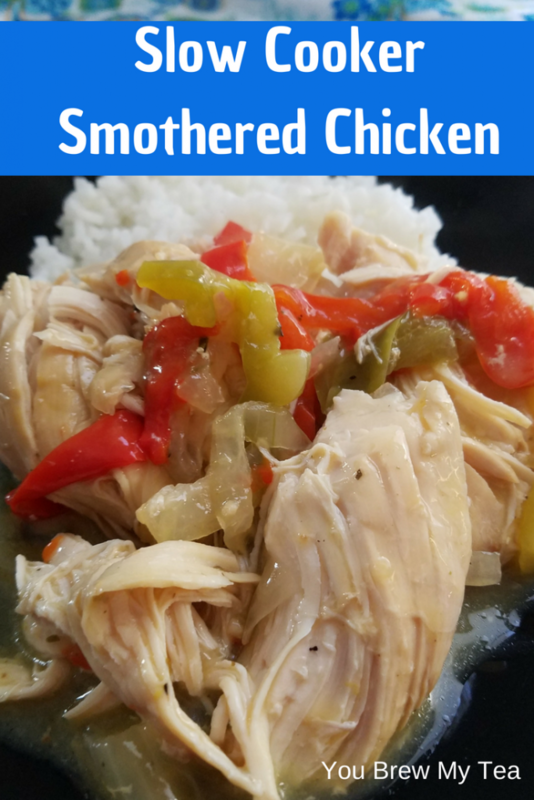 There are so many ways to add flavor and make them a great meal option, and these smothered chicken breasts are some I adapted from a recipe shared in a church cookbook many years ago. They are moist, tender, and have tons of flavor. We serve over rice, but you could easily add over cauliflower rice or pasta if you preferred. 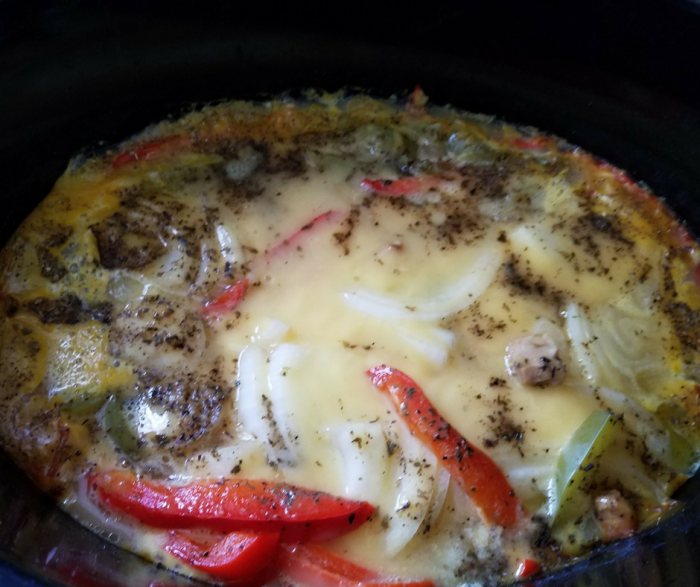 For this recipe, I use the Crockpot 6-Quart Programmable Cook and Carry slow cooker. It’s my favorite slow cooker because it is so versatile. Any slow cooker will work of course, but if you are looking for a good one, I can’t say enough about this one for ease of use and functionality. Line using Crockpot liners or spray bottom of slow cooker. Sprinkle both sides of the chicken with Italian seasoning blend, salt, and black pepper. Place the chicken breasts in an even layer on the bottom of slow cooker. 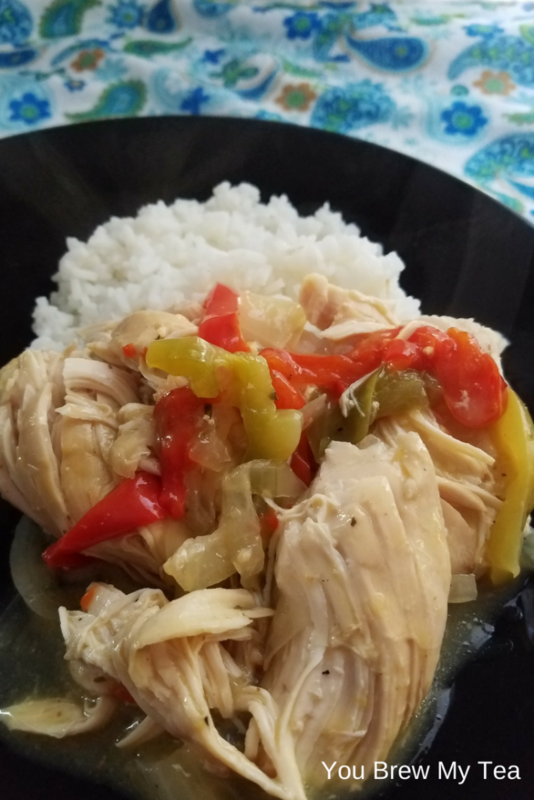 Top chicken with sliced red pepper, onion, and garlic. In a medium bowl, mix together the 2 cans of cream of chicken soup along with 1/2 cup of water. 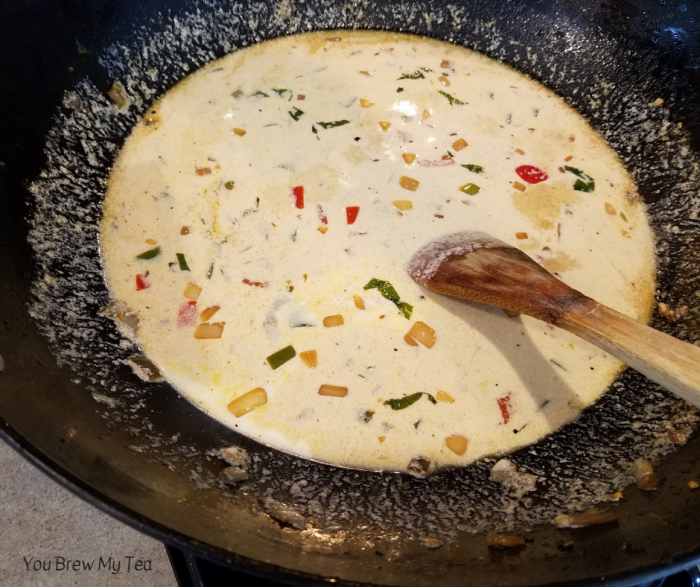 Pour cream soup mixture over the top of chicken and vegetables. Place lid on the slow cooker and cook on high heat for 3 hours. 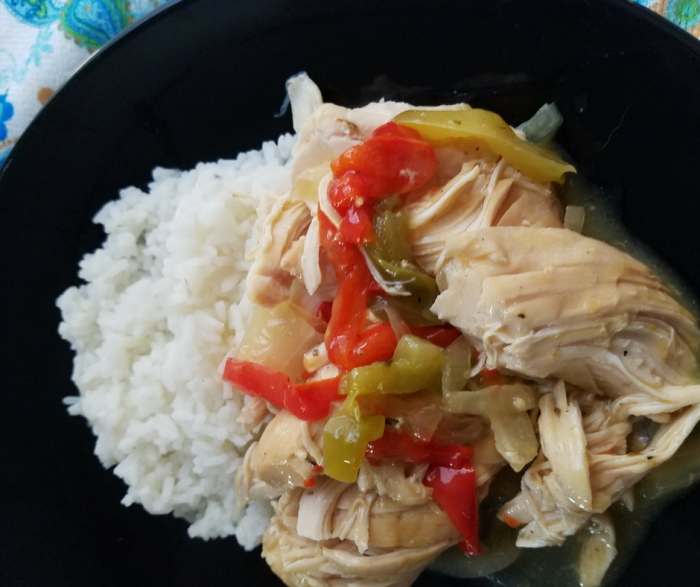 Shred chicken and serve with vegetables and sauce over rice or noodles. In a medium bowl, mix together the 2 cans of cream of chicken soup along with ½ cup of water. There is nothing fancy about this meal, but it is definitely one of those comfort foods that your family will enjoy. Kids can easily pick out the peppers and onions if they don’t care for them, and you can serve with a side of any favorite vegetable. If you are on the Weight Watchers plan like I am, you can measure out 1/2 cup of rice for only 3 extra points. That’s not bad at all for a very satisfying and easy meal!